Without a doubt, CES 2015 has been a huge show for SSD companies as practically everybody had something interesting to show. 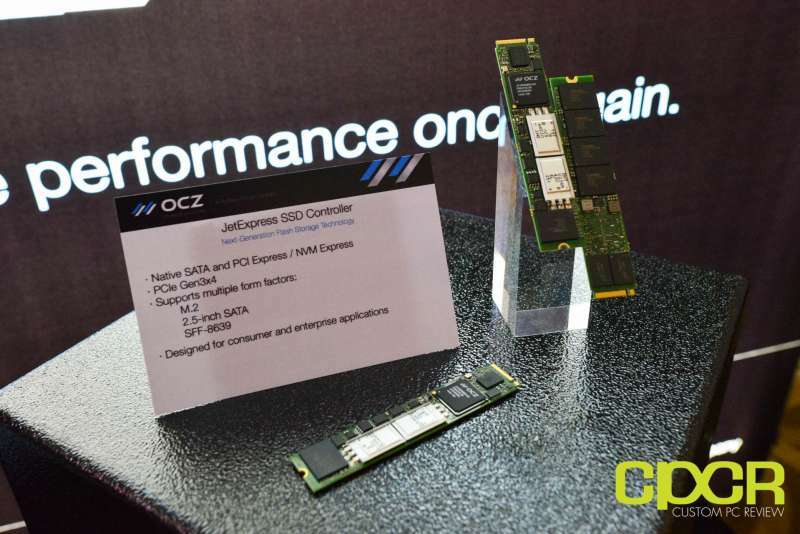 One of those companies is OCZ Storage Solutions who was quite excited to reveal their upcoming JetExpress SSD controller, which according to the company had been in the works for several years. The biggest feature for the new JetExpress controller is that it’s going to be very versatile. With a physical footprint that can fit into a 22mm wide M.2 form factor, the JetExpress controller will natively support both PCIe Gen 3 x4 and SATA along with AHCI and NVMe. This will allow both future consumer and enterprise SATA and PCIe SSDs to utilize the same controller albeit a different firmware configuration. Additionally, the JetExpress controller will get all the features you’d expect from a modern SSD controller such as low power states and DevSleep for mobile applications, TCG Opal 2.0/IEEE-1667 support for advanced hardware encryption, and LDPC error correction support to help greatly improve NAND endurance. Speaking of LDPC error correction (ECC), JetExpress will actually support both the simpler BCH ECC that’s fairly common today and the more advanced LDPC ECC algorithms that everyone has been transitioning to thanks to the proliferation of lower endurance TLC NAND. OCZ tells us that depending on the application, the JetExpress controller can actually be set to use BCH ECC, LDPC ECC, or a hybrid ECC mode. For applications where most performance is most needed, BCH ECC will be used throughout the SSD’s life while applications that need the longest endurance will use LDPC ECC throughout its life. OCZ will also offer a hybrid ECC mode that uses faster BCH ECC in the beginning of the SSD’s lifetime and switches to slower LDPC ECC as the drive ages, but this adds a bit of unpredictability in drive performance down the line which may be undesirable for enterprise applications. In terms of the architecture, JetExpress will use a multi-core design and will carry over the same Aragon co-processor first introduced with the Barefoot 3 controller. While we weren’t told exactly how many cores would be available in JetExpress, we were told that it’d be quite a bit more than what you’d find in the Barefoot 3. The JetExpress controller can also support up to 10-channels in parallel, but the number of channels that will actually be utilized will depend on the application. SATA consumer drives for example can use 8 channels while select PCIe enterprise drives could use 10 channels. Native support for PCIe Gen 3 x4 and an improved memory controller with support for up to 32GB of DRAM will give the JetExpress controller plenty of room to push the boundaries of performance and capacities down the road. PCIe Gen 3 x4 has a maximum theoretical bandwidth of up to 32Gb/s (~4GB/s) and speaking with OCZ representatives, the JetExpress controller can easily support 2TB, 4TB, 6TB, 8TB or larger SSDs – the biggest limiting factor being the amount of NAND that can be crammed onto a physical drive. OCZ expects to begin shipping JetExpress in the 1H2015 to enterprise customers while a rollout to consumer drives is expected to begin in 2H2015.